Bring a small pot of salted water to a boil. Add the asparagus and cook until it pops in color, 2 minutes. Using a slotted spoon transfer immediately to an ice bath. Once cooled, remove and pat dry. Using a mortar and pestle or mini food processor, crush or combine the mint leaves with the salt, oil and lemon juice until you have a dressing. Arrange the greens in a bowl or on a plate. Top with sliced strawberries, blanched asparagus, toasted pepitas, crumbled goat cheese and a good drizzle of the lemon/mint dressing. A salad so fresh and pretty it's like eating ART. We know we gotta eat 'em. We know we need 'em. We know about that freedom. But sometimes the idea of eating a salad makes me want to yank out my own esophagus and flush it down the toilet. I'd much rather back up a U Haul with 14,000 tacos into my pie hole than think about SALAD. Yawn-o-tron. To me, salads have to be done jerst rawght. If they are standing alone as the main course, they must absolutely be loaded up with all kinds of textures and flavors and sexiness. Or, if it's acting as the smaller side salad leading up to the main course, it has to have just right amount of delicateness and balance, so not to throw off your entire meal, and life. Let me introduce you to your new favorite salad evah. The reason it's going to be your new favorite is because (sit down) it can act as EITHER a side salad OR a dinner salad! AH KNOOOOWAAAA. It's so stinkin' simple to pull together, and if you want, you can always add grilled chicken or salmon, or shoot y'all, STEAK and your head will explode like a pinata on Christmas morning. 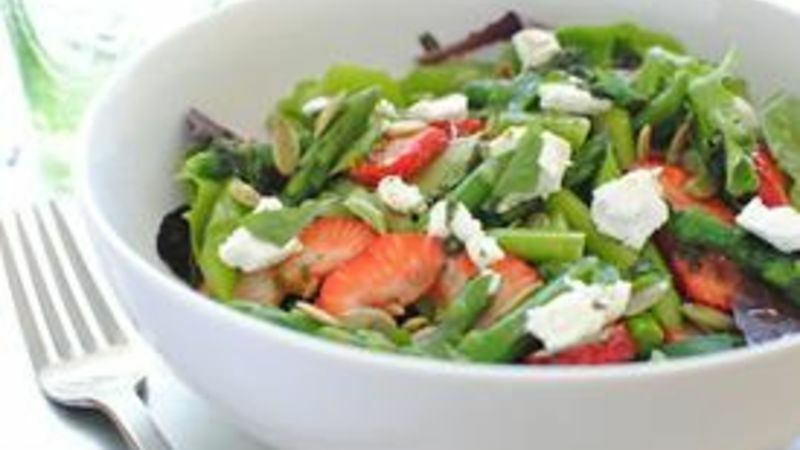 We have spring greens, asparagus, strawberries, goat cheese, pepitas and MINT. Give your spears and straws some nice slicing action. Toast up your pepitas in a small skillet or toaster oven, about 5 minutes. Boil the asparagus in some water for 2 minutes. Then transfer them to an ice bath. Blanching is fun! In the meantime, crush up some mint with a pinch of salt, oil and a good squeeze of lemon juice. If you don't have a mortar and pestle, a small food processor will be just fine. Seriously, all you do is put it together. Arrange the greens, then top with strawberries, blanched asparagus (that you pat dry), GOAT CHEESE CRUMBLES (lick your fingers. that tang! ), the pepitas and the super fresh lemon/mint dressing. I always sprinkle a teeny bit of salt over the final thing, but you don't have to. Don't you want to climb into this totally super fresh spring salad and never come out? This recipe makes one salad. And like I said, eat as is for lunch, or as a side with dinner. Or add mounds of protein and surrender to the angels of bliss. Because I did. *Bev wants you to know that she will never EVER rip out her esophagus. It would be too messy of an ordeal. For more musings, visit her blog Bev Cooks and her Tablespoon profile.